Join others who love and appreciate animals and the richness they bring to our lives. Feel the ultimate reward of caring for our four-legged friends in helpless situations where inadequate resources sometimes mean life or death. 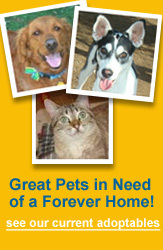 Forever homes and foster homes are needed. Please help a pet. We Lovingly Help Them When There's a Need. Welcome to Retrievers & Friends of Southern California, Inc. (RFSC) We are an all-volunteer, non-profit organization devoted to finding homes for Golden Retrievers & Labrador Retrievers, as well as other breeds of dogs as space allows. 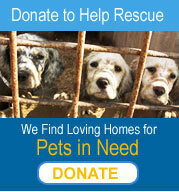 Can you provide a foster home or forever home to a pet in need? Heed the call to make a difference by opening your heart and your home, today! This is Ben, a beautiful quarter horse who is approximately 7 years old and is approximately 13.2 hands. The Horse Trainer, Beth Edwards has spent a lot of time and effort working with Ben. As you can see, he is a beautiful horse. Ben is available for adoption. What a great weekend we had with our friends from the Apple company. They sent a group of volunteers to help at the rescue. We had 2 big projects that they completed for RFSC. The new public bathroom has a beautiful new coat of paint and our fence is now decorated with our logo. We appreciate the employees of Apple giving their time and talents to help RFSC. It's easy to support RFSC when you shop at Ralph's or Amazon. You can register your Ralph's card with the Ralph's community rewards program and earn money for RFSC when you shop. Even if you have already registered, you MUST re-register every year in September/October. Please register or re-register now. If you have already registered your Ralphs' card, please note that our organization number has changed. Our new organization number is RV651. Click here to register your Ralph's Rewards card. Amazon.com donates 0.5% of eligible AmazonSmile purchases to your charitable organization. Just pick Retrievers and Friends as your charitable organization and be sure to use smile.amazon.com to make your purchases. You can use your existing amazon.com account. SPOTLIGHT ON: Our New Building has Air Conditioning! We are so grateful for the new building and the air conditioner. 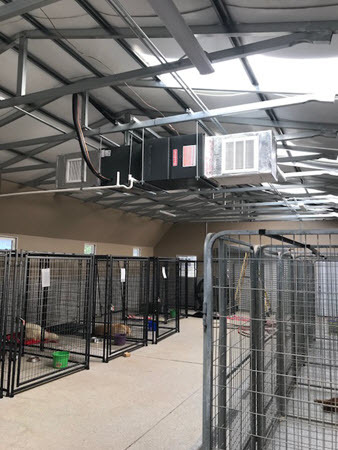 The new A/C unit keeps our precious dogs comfortable and out of the heat. 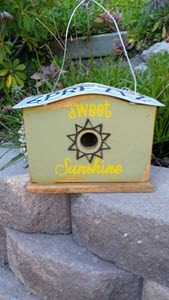 One of our volunteers, Jolinda, makes custom birdhouses and donates the proceeds of her sales to RFSC. She makes each birdhouse individually from recycled items. 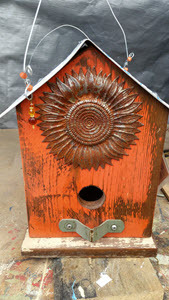 Jolinda designs each birdhouse herself. Each birdhouse is special and unique. 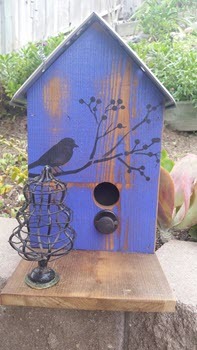 Jolinda attends artist fairs such as the Fallbrook Avocado Festival and has an ETSY store called BirdHousesforTheDogs. She has sent birdhouses all over the United States. She takes special orders and can include the customers own personal treasures on the birdhouses. Her customers are delighted to know that their purchase goes to help RFSC. Jolinda and her husband have adopted several Golden Retrievers from RFSC. They currently have Otis who is 3 years old and Grace who is 6. 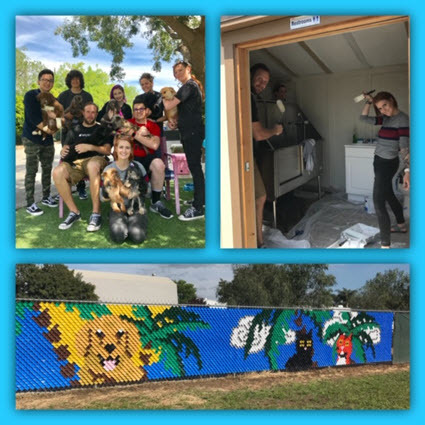 Retrievers & Friends of Southern California, Inc., was formed to rescue and re-home Golden Retrievers and Labrador Retrievers, providing an alternative to the animal shelter for owners who can no longer keep their dogs. We are a full-service rescue, with dogs coming to us from all over the Southern California area for foster care services. RFSC not only provides care for dogs while they are waiting for adoption, but we provide follow-up assistance for the life of the dog. If for any reason a family can not keep a dog, the dog is brought back to the organization for placement. We have volunteers that perform home visits before each adoption. Our geographic adoption area is Riverside, San Diego, Orange and certain areas of San Bernardino counties. 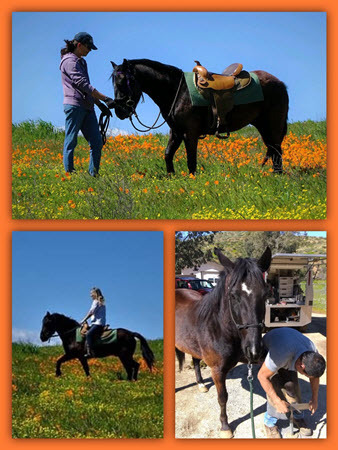 We cover areas of San Bernardino county that are 1 hour or less driving distance from Temecula. In addition to Golden Retrievers and Labrador Retrievers, RFSC also accepts mixed breeds and other small purebred dogs as space allows. 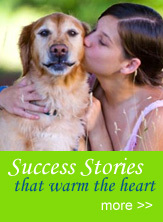 We accept Goldens and Labs of all ages, including seniors and those with special needs. All dogs are spayed and neutered and updated on vaccinations if not already done by the owner. Dogs with special medical needs are further evaluated by our veterinarian for treatment. Your donations are always appreciated and help us to continue to care for these special dogs. Because we are an all-volunteer group, 100% of all adoption fees and donations are used for the care of the dogs in our program. Your tax-deductible donations are appreciated!